The Lost Highway's B-movie Reviews and Cult Films » Blog Archive » The Drive-In: A “B” Movie with Blood and Popcorn, Made in Texas by Joe R. Lansdale. 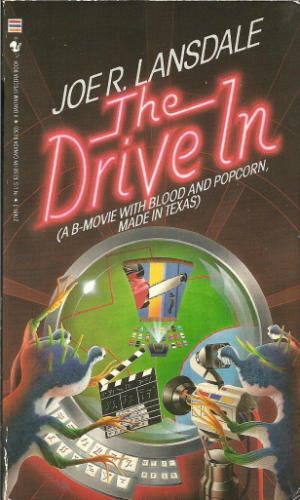 The Drive-In: A “B” Movie with Blood and Popcorn, Made in Texas by Joe R. Lansdale. Comments Off on The Drive-In: A “B” Movie with Blood and Popcorn, Made in Texas by Joe R. Lansdale. 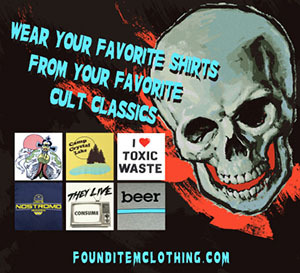 I’ve always had a fascination with the drive-in culture and mythos. Those times of watching a great b-movie out under the stars and making that long walk to the snack shop for that buttery snack are some of my best teenage memories. I’ve gathered quite a few books about their history so a few years back when I ran across a novel with the “Drive-in” in it’s title, I had to give it read. It’s described as a living B-movie where the patrons of a drive-in become characters in a b-movie and are being directed by some malevolent alien forces. That sounded like fun campy storytelling to me and even it’s book cover suggested a sort of “Hitchhiker’s Guide” silliness. Don’t be fooled. This book is dark, twisted and bleak. Blood cults, cannibalism and the worse of humanity take root as societal norms break down and the horrifying popcorn king begins it’s reign of terror. Lansdale’s descriptive storytelling and compelling characters made it’s somber outlook on society all that more visceral to me. I found myself more trying to endure it’s twisted story than be entertained by it. I even had to take a break and watch a sitcom just to have a warm fuzzy feeling again. Retroman Steve says check it out but you’ll likely never look at drive-in popcorn the same way again.